When Allen Peto looked into building a retirement home for him and his wife, he saw an opportunity to help the community by using his home as a model for energy efficient housing. “Our goal was to build an efficient home so we don’t get caught with high heating and maintenance costs during our retirement,” said Peto. Peto needed an energy efficient shell for his new Cedar Lake, Manitoba home. He chose the Advantage ICFs system® and Insulspan® Structural Insulated Panels (SIPs). Peto immediately recognized the benefits of this type of construction, and had an idea. He enlisted Riding Mountain Development Corporation to use his house as a training tool for local crews. 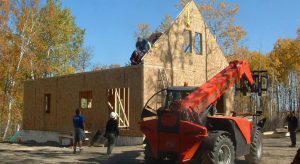 Construction foreman Alvin Bone of Riding Mountain Development Corporation trained two construction crews on how to install the Insulspan SIPs and the Advantage ICFs. One crew hailed from Keeseekoowenin First Nation, the other from Rolling River First Nation. Neither Alvin nor his crews had experience working with SIPs. But, they were able to close-in the 1040-square-foot house in just two weeks. The Insulspan SIPs and Advantage ICFs arrived at the construction site custom cut to the design of the home. There was also a technical expert present, providing Alvin and his crew with onsite technical assistance. See more First Nations projects here.